There is a plethora of local activities and clubs available for all ages: from golfing, tennis (naturally), fencing and bowling, to the quirkier handbell ringing, Dunblane stone hunting, and Alpaca trekking in the nearby village of Thornhill. There are opportunities locally for most interests and activities, except maybe for the extreme adventurers amongst us. Opened in 2004, the mainly self-funded Dunblane Centre was set up to provide arts and sports facilities to the local community, and is a friendly environment which offers fitness classes, pre-school and youth activities. Local youth groups such as scouts, girls’ and boys’ brigades and the Air Training Corps are also very popular. For those who like to do their bit for the community there are numerous voluntary groups, from First Responders to Dunblane in Bloom – for the green-fingered amongst us. By and large, the people who you encounter on the street are helpful, warm and welcoming: a lovely feature of living here which visiting friends regularly comment on. Surrounded by miles of beautiful countryside in Dunblane, locals are spoilt for choice with outdoor pastimes. Whether you enjoy exploring the numerous woodland walks in the newly upgraded paths of Laighills Park and Sherrifmuir, or challenging yourself on biking trails, both are on your doorstep. It’s not unusual to meet a variety of wildlife in these tranquil surroundings: grey heron are a common sight on the river and red deer can often be encountered on an early morning dog walk. Substantial investment has recently transformed the town centre streetscape from outside the train station and across the Allan Water making it a welcoming sight for visitors and locals alike. Adjacent to the river, the High Street, with its range of eateries, gift shops and other businesses, plays host to a popular annual Christmas Extravaganza event. A few years ago there wasn’t much in the way of nighttime entertainment but now the High Street boasts an excellent range of restaurants and bistros, including the award winning Another Tilly Tearoom (which serves up first-rate home baking and lunches), the Old Churches House Hotel, The Village Inn, the Riverside pub and a little further afield for the gastronomically-demanding, The Kailyard by Nick Nairn at the DoubleTree Dunblane Hydro Hotel and Cromlix Hotel. The High Street boasts an attractive combination of contemporary and traditional stone buildings and a wander though the main shopping route will bring you out at Andy Murray’s golden post box, the oldest purpose-built library in Scotland Leighton Library, and Dunblane’s impressive 13th Century cathedral which is the best known feature of the town’s landscape. The town also offers homebuyers a range of interesting property choices from traditional flats around the town centre, charming whitewashed cottages in the nearby conservation area of Ramoyle, to the surrounding suburbs where modern executive homes and impressive detached Victorian villas can be purchased at favourable prices compared to Glasgow and Edinburgh. Due to its central location, Dunblane has easy access to the A9, making both Glasgow and Edinburgh within commutable distance – as well as the wider Central belt. Both Glasgow and Edinburgh airports are within an hour’s drive of Dunblane. The train station has regular links to both cities as well as Stirling and Perth, and there are frequent bus services in and out of the town. The excellent reputation of the local schools in Dunblane is another major draw for parents of school-age children. Dunblane High School recently ranked second in the listings for Scottish state schools for Higher exam results, and there are three primary schools in the area offering parents an excellent choice of primary education, with the added benefit of nursery facilities. The local schools have strong links with the community and encourage relationships with local businesses and public groups. There are well-supported parent councils which hold regular fund-raising events to improve the amenities and opportunities available to the schools. Only a short distance away, you will find The University of Stirling, which has ranked in the top five universities in Scotland for criminology, media and communications, education, social work and marketing. Parents all want to provide a safe place for their children to grow up and Dunblane’s low crime rates and community character gives many parents the assurance that their children can play outside safe and sound. Outside of the early morning and evening commuter travel times (it really can’t be called rush hour here), the town has very low volumes of traffic which helps provide a safer environment for the countless number of children who go to school on foot each day, some in “walking buses” organised by the local schools. So, are you considering a move to Dunblane? 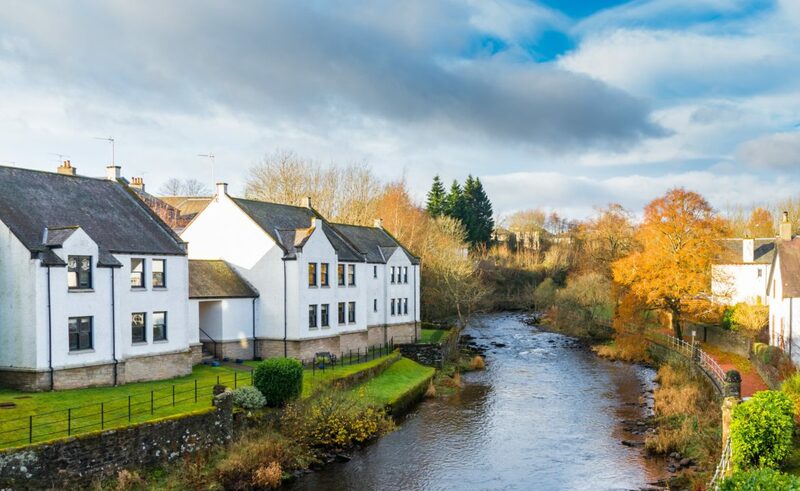 Now that you know what makes Dunblane so desirable and such a fantastic place to live, if you are considering a move to the area, feel free to give us a call. Our team in Dunblane has a wealth of knowledge regarding the local area and would be happy to answer any questions which you may have about the town or any of the surrounding areas. We at Cathedral City Estates would be delighted to assist you with your move to our beautiful town, so please do give us a call on 01786 821 012.